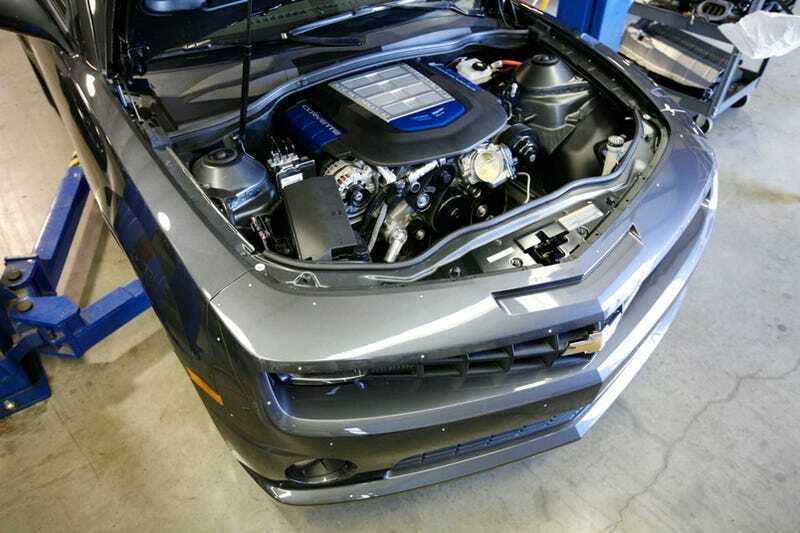 The power hungry folks at Hennessey Motorsport in Houston just completed their first swap of a ZR1-sourced LS9 into a 2010 Camaro, creating the HPE700 or what Chevy should call the Camaro Z28. Out of 24 of these ultra-Camaros, only 13 are currently left which means you had better start making decisions on parting ways with your hard earned $109,000 or else you'll never get to feel the adrenaline rush of 705 ponies running through your long, luscious mulletard hair. What you're looking at here is just the first step in the process of turning the meager-Camaro SS into a supercharged and carbon-fibered UFC fighter. If the Corvette ZR1 is anything to go by, this swapped ride will come with a swift kick in the pants standard. We can't wait. "The HPE700 Camaro allows our customers to combine supercar power and performance with classic American muscle car looks in a modern, daily-driver usable sportscar with a backseat and a trunk!," says John Hennessey, President and CEO of Hennessey Performance Engineering. "We will be announcing other Hennessey turnkey vehicle packages for the 2010 Camaro in the near future along with an extensive list of aftermarket performance parts and accessories." But for now, the LS9-powered HPE700 Camaro, replete with ZR1 inspired looks and performance promises to be at the top of the American muscle car food chain later in 2009. HPE700 buyers will also receive a 1-day performance driving course at Lonestar Motorsports Park – a 1/4 mile dragstrip facility located adjacent to Hennessey's 24,000 square foot production facility and showroom.